K. S. Thomas is the first author in my inaugural Romance In A Month class to publish the full-length novel she wrote. She not only completed her first draft within a month, she also revised and edited Lost Avalon in the following month and is well on her way through the first draft of her upcoming romance, Unhurt. Here's K.S. to tell us about her writing and her experience with Romance In A Month. Tell us about your writing. What types of stories do you like to write? I’m kind of all over the place when it comes to my writing. For the most part, I’ve kind of always just gone with the story, whatever it may be…so I’ve written everything from Children’s Lit to Thrillers. I love writing strong heroines, whether it’s action and suspense, or some sort of romance (which seems to be the bulk of what I’m writing these days). What stimulates you to write? How do you motivate yourself on days you don’t feel like writing? Before Romance in a Month, how involved were you with other authors? How long did it take you to write a first draft? I’ve had a handful of author friends since I started in this business and have always been a part of several different groups, but nothing as involved or as supportive during the actual writing process as this class has been. On average it usually takes me between two to three months to complete a novel, but even with juggling a second project, this class made it easy to complete the first draft within the thirty days. What made you sign up for Romance in a Month? What did you learn and enjoy the most about the class? I always like to challenge myself and continue to push myself as a writer. Signing up for a class where I’d be assigned a trope before knowing the story and given a timeframe to write it in seemed like a great way to do that. My favorite part about the class was the immense amount of support shared among the writers. It was an exciting process to be a part of so many different stories being told at the same time. I also really enjoyed the daily character questions which gave me a lot of insight into my hero and heroine and made me think about their motivations and thought processes more than I would have otherwise. Tell us about the story you wrote for the class. Was it something you would never have written without the class? What about the class made your story different from how you would usually write? I purposely waited until the last minute to get my assigned trope because I wanted as little time to think about the story ahead of time as possible (part of the challenge for me was to see if I could come up with a specific storyline rather than just write whatever comes to mind and then figure out what it is after…which is what I usually do) So, it’s safe to say Lost Avalon would not have been written had it not been for this class. What do you do differently now that you’ve written a story with the class? What was something you liked most about the class? I loved the daily posts we all did. Not only was it fun to read everyone else’s stories and see how they all progressed, but I also looked forward to posting my own snippet every day. It was great motivation because all day long I’d be wondering about what I’d have to share by the end of the night, and it made me that much more excited to sit down and write. Thanks for doing the interview and I hope we’ll meet many more classmates for the September 1-Oct 15 class. Avalon Jennison has been the girl next door since she was five. The best friend since she was eight. The band manager since she was sixteen, and the keeper of his secrets always. Ava's been there every step of the way, helping Blaise live his dreams and keep his nightmares at bay. But the years of putting Blaise's needs above her own are about to be over. However, Blaise has one secret even Ava doesn't know…and it could be the thing that breaks her heart completely, or finally puts it back together. From Sept 1 to Oct 15, 2014, we're opening up the Romance In A Month group. There is no cost for the class. If you're interested in writing along with a group of friendly, fun, and slightly crazy romance authors, please contact me (Rachelle) at my Facebook page https://www.facebook.com/RachelleAyalaWriter. 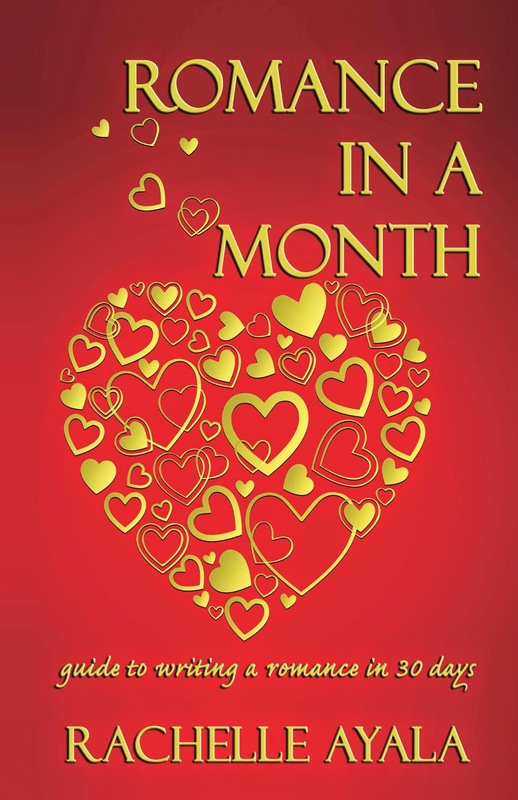 The Romance In A Month textbook is available now on Amazon. It contains all of the lessons and slides [in bullet form], as well as resources for brainstorming, and a reading list. I hope you'll join us and share our adventure in writing a Romance In a Month [and every month after that]. Watch my blog for more author interviews and exciting news from the RomanceInAMonth authors or RIAMers - because writing romances is addictive. Congrats, K.S. Challenging ourselves as writers is something we should do constantly. Glad to hear how supportive the group has been to you.